Who’s the genius behind prosperity alliance? 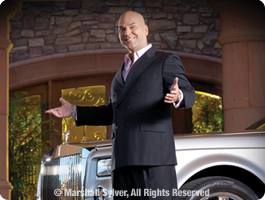 You may know Marshall Sylver as the #1 leading expert on subconscious reprogramming and irresistible influence. For over twenty years, Sylver has entertained, educated, and transformed the lives of thousands of people. He is the author of Passion, Profit, and Power, and through infomercials has sold over a million copies of his personal development programs worldwide. In fact, his teachings on personal development have been the main attribute to his worldwide acclaim. He has led training programs for IBM, Ford, KFC, and Pepsi, teaching the management of these leading corporations how to motivate employees while also teaching staff how to easily produce higher sales. Sylver has been named “The Millionaire Maker™ and is one of the most sought-after keynote speakers to date. He has been invited to teach on other speaker’s platforms including: Donald Trump, Robert Kiyosaki, Bill Clinton, Robert Allen, and many others. Through education, Sylver motivates people to take action in the present moment and change their lives in a positive way forever. With that, Sylver was itching for a bigger challenge and is now on a mission to win a NOBEL PRIZE for single-handedly turning around the economy of the United States. With this mission in mind, Sylver has created a whole new curriculum as well as a business opportunity where his students are now able to profit up to 70% gross of each sale of his new programs. Prosperity Alliance™, Sylver’s latest masterpiece, is a coalition of individuals committed to help each other create abundance in their lives as well as help solve all of the world’s financial challenges through education.